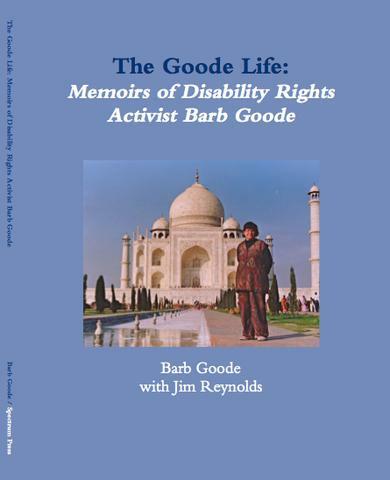 Memoirs of disability rights activist Barb Goode. The inspiring story of one of Canada’s most remarkable and humble citizens who, in her mission of supporting equality and giving voice to those who had no voice, traveled much of the globe and met some of the greatest leaders of our age and some of the most vulnerable of citizens. Barb Goode is a self-advocate leader who has done amazing things in her life and this is her story. There could be no better representative for Spectrum Press’s first work by a self-advocate than Barb, who has so positively and continuously worked to grow and cement her network, and demonstrated what she might do, against the odds. Barb prepared for writing this work by taking a number of writing classes, and has been clear throughout the process about the need to use plain language and that her voice be honoured. Supporting her has taught us a great deal. We’ve extremely proud to be part of her goal to write this book. “She sums up her career as, ‘Doing things people didn’t think I could.’ [She is] one of the foremost builders of the modern day disability movement. A hero who deserves to be included in the same breath as Terry Fox and Rick Hansen.” – Al Etmanski, author of Safe and Secure: Six Steps to Creating a Good Life for People with Disabilities.